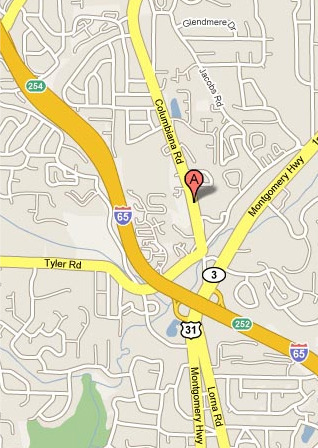 Our church campus is located at 2901 Columbiana Road in Vestavia Hills, Alabama, just off of I-65 and Hwy. 31. Click here to visit a Google Maps page for custom directions from your location or follow these general directions. Cross over US 31 onto Columbiana Road. Go through the intersection of Columbiana and Tyler Roads. Saint Mark is approximately 1/4 mile on the right. Exit left onto US 31 North. Take first left onto Columbiana Road. Go through the intersection of Columbiana and Tyler Roads. Saint Mark is approximately 1/4 mile on the right.